A smooth, creamy, all purpose coconut cooking butter that is processed without chemicals. Cholesterol and trans-fatty acid free, it has no coconut taste or aroma. This product is resistant to high temperatures without burning therefore making it excellent for all types of cooking, baking and frying and ideal for deep frying. It is suitable for both Vegetarian and Vegan diets. Use as a wonderful dairy free alternative cooking oils, shortening, margarine, spreads and goose fat. Perfect for frying, baking and cooking. At temperatures above 29°C oil will liquify this is a natural process and no goodness is lost in the transition. 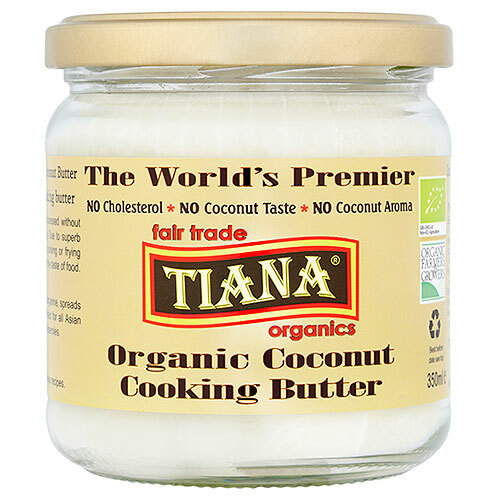 Below are reviews of TIANA Pure Coconut Cooking Butter - 350ml by bodykind customers. If you have tried this product we'd love to hear what you think so please leave a review.